My Summer Cottage in Babylon: I hate it, so let's talk about it some more. That was freaking hilarious! I'm gonna watch Twilight again (yes, I've already seen it -I'm so ashamed) just to see my new favorite characters! OMG, that was hilarious. I actually commented. It almost makes me want to see the movie. Almost. I'm determined to finish the series. I'm more than halfway through. I hate the series and myself a little more every time I read it. I think you are a closet twilight lover. Admit it! If it had come out 18 years ago and starred Winona Ryder and River Phoenix, I'd have been the biggest fangirl EVER. But as it is, and considering my age...not so much. Maybe you are missing the point!!! Most people love it... LOVE it! 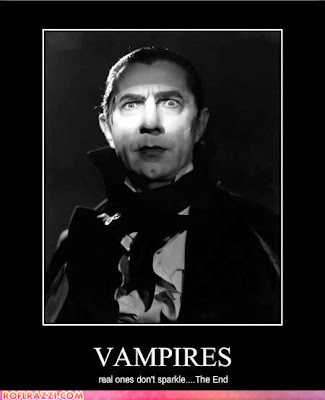 Just because you hate twilight doesn't mean the rest of the world does hence why you see it everywhere. Giggles. Just when you think it's over it starts again. Sorry you hate the book.... The movie is really cheesy!!!! I didn't like it. but maybe you would we are opposites. Brandi, I highly recommend seeing the movie for the sheer ridiculousness of it. People were honestly laughing out loud at parts that weren't supposed to be funny in the theater. See the movie. You'll feel even more justified in your loathing! i think you already may know my opinion on the book. i found it so boring that i fell asleep over and over again and that's when i wasn't pregnant and on methyldopa. i finally decided that it was not worth my time. teen romance has never been my genre. even though i don't think the book is interesting or all that well written, i still call Stephanie Meyer a genius. just like J.K. Rowling found a way to write 500+ page books that little boys read over and over again even if they dont like to read, Stephanie Meyer found a way to write 500+ page books that teenage girls obsess with. Brandi - borrow someone's copy and watch it. Don't spend money to rent it or anything, it's not worth it. But borrow and watch. Mostly because all of us twihaters LOVE the movie. Because RPattz looks like he's going to cry over his career and KStew really does only have 2 faces. I'm borrowing it so Cheyenne can watch it for his horror movie blog. He can't wait to review it. It's SO bad! When he does review it, I'll let you know. And Cactus, Golden Onion, and Front Door are my favorite characters. I agree with Sylwia. The woman is a genius. After reading stuff about SMeyer I wonder if she did it all as a "gotcha!" I mean, sure, they blow...but she's the one laughing to the bank (with bodyguards since she's probably stalked often) Then again, I feel bad for the woman's husband. How's he feel about Eddie?